Children love stories. Stories are magic, they can create other worlds, emotions, ideas and make the everyday seem incredible. They can teach us empathy and take us on terrific journeys. They can make us laugh, cry, jump with fright and then comfort us with a happy ending. From a very young age we learn how to enjoy a story both for pleasure and to help us make sense of the world and ourselves. In this article I’ll look at why stories are important for ESL students and I’ll share some simple story-based activities that can be adapted for different ages and abilities. In the ESL classroom stories have a special place and value. Students can listen to the sounds and rhythms of English just as native speakers will have done to acquire their first language. Students can identify vocabulary and expressions that they have learnt or heard regularly and see them in use. Frequent telling can help them to learn new phrases and expressions with the correct emotional resonance. Storytelling with participation uses experiential learning to ask about what is happening to the characters and what they should do next, or offers a student the chance to be that character and hear/say their words in a true context. Storytelling brings language learning alive and creates a participatory and immersive experience that allows Young Learners to enjoy hearing the language in a dynamic, sometimes stylistic and entertaining way. Participation using key vocabulary and phrases can create an awareness of rhythm and structure. This atmosphere of play and creative expression creates an appetite for more similar experiences. Students who have enjoyed storytelling in class often ask for more stories and also feel motivated and encouraged to create and tell, act out or illustrate their own stories in a variety of ways. 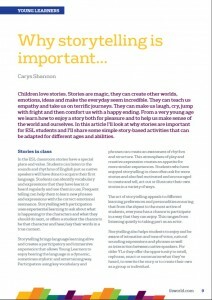 The act of storytelling appeals to different learning preferences and personalities ensuring that from the shyest to the most active of students, everyone has a chance to participate in a way that they can enjoy. This ranges from listening quietly to taking part as an actor. Storytelling also helps students to enjoy and be aware of intonation and tone of voice, natural sounding expressions and phrases as well as interaction between native speakers. For older YLs they offer the opportunity to retell, rephrase, enact or summarise what they’ve heard, to rewrite the story or to create their own as a group or individual. Stories also offer a link between the classroom and home. Students may have the same books in their own language at home; they may read with a parent or family member and be able to identify vocabulary in English; simple stories in English can be read again by a parent at home. Many stories also have talking books, YouTube videos, animations or films in VOSE that could be enjoyed after the session. Stories offer everyone a chance to enjoy language and discover new worlds, new words and new things about themselves. Enable children to empathise with unfamiliar people/places/situations. Offer insights into different traditions and values. Offer insights into universal life experiences. Help children consider new ideas. Reveal differences and commonalties of cultures around the world. Promote a feeling of well-being, fun and relaxation. Increase children’s willingness to communicate thoughts and feelings. Encourage use of imagination and creativity. Make your own based on the vocabulary you’re studying in class or choose from a whole range of templates online (try this online generator from ReadWriteThink: http://www.readwritethink.org/files/resources/interactives/cube_creator/). Story dice offer input from basic vocabulary nouns to action verbs or adverbs. Use them to construct a story in groups or for fast finishers as a speaking activity in pairs. Story grids are so flexible – all you need is to be able to draw lines! Elicit current vocabulary from your students for a whole class activity or let individual imaginations run wild. Story grids are great for recalling and classifying vocabulary into word groups (e.g. write three nouns, two adverbs, a collocation and an idiom from the current set). Once inputted into the grid the options are varied: you can ask students to swap grids for an extra challenge, create stories in groups or set the story writing for homework after eliciting possibilities and combinations in class. You can even use a ‘heads up’ board grid to play Whispers with invented stories. The online world makes story generation easy. Use the Story Maker from the British Council Kids website (http://learnenglishkids.britishcouncil.org/en/games/story-maker) to create a horror or fairy story with your class. Choose from picture-based options and read or act out the final text together. Great for a further comic strip activity or use it as pure creative imagination time. Online websites such as Story Bird make creating beautiful and professional storybooks with your class easy. The artwork can be used as stimulus or as an accompaniment to your own story. Hugely motivating. Carys Shannon is an experienced ESL teacher and cultural facilitator with professional credits in theatre production and writing. Currently teaching at IH Academia Britannica Sierra in Córdoba, where she has been based for the last five years, Carys also carries out teacher training workshops and storytelling sessions for Macmillan Iberia. Her interests lie in utilising drama and theatre skills within the ESL classroom for all ages and levels as well as working with storytelling as a vehicle for language learning and production.